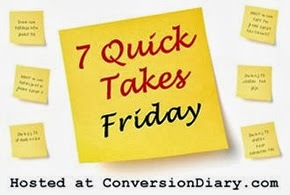 I'm linking up with Conversion Diary for 7 Quick Takes Friday! Who says I don't live large? 1. Today was Dr. Day. As per usual... I forgot what time my appointment was and had to call at 8am to find out when I was supposed to go which meant I was up earlier than usual. Refer to previous comments about no longer being a morning person. At any rate... it was at 11am which meant I had time to shower and "style" my hair (style = not a sopping wet side braid). The appointment was no different than usual... give them my debit card so they can take all my money... pee in a cup so they know I'm not on crack... see Dr. Hottie and review meds... get refills for meds... go home. I had a form from my disability lawyer for the doctor to spell out what type of work I can and can't do. Dr. Hottie wants me to get an evaluation from a Physical Therapist before they complete the form. It's an extra expense (I don't know how much yet) but... he said if they had to go back through my records to validate how they know that my injuries and afflictions result in specific restrictions of motion, etc, there is nothing there really to substantiate what trial and error over the course of the past two years and nine months have shown us. In other words, me saying it hurts and them knowing it hurts isn't enough to prove it hurts. He feels like this is an investment in speeding up the disability process. Ultimately, from one side or the other it's going to come down to proving my inability to do certain things and having the earlier record from a doctor who I'm paying vs. a doctor who is paid by the Social inSecurity people is worth the time and money. I see where he's coming from. I hate the thought of spending the money but it makes sense. Road block on getting that form together until I can get in to see the Physical Therapist. We hit another roadblock in determining the cause of my left-sided abdominal pain. He thinks it's a hernia based on where it is and just from him pushing and probing on me but it really requires a full work up to know for sure. Full workup = money I don't have so for now the game plan is to treat it as if it's a hernia and exercise care in lifting things, etc. If the pain gets worse go to an ER. Healthcare in America, folks. It's a beautiful thing. 2. It was a gorgeous day to be out and about. I really can't believe this string of beautiful weather we've had. It feels unprecedented - I can't remember another time where the weather was this perfect for this many days in a row. I took pictures as I was stopped in "traffic" at the town square on my way home. The word "traffic" is really relative. Cars back up around the town square in the middle of the day and on tourist-y weekends. Having lived - and commuted - in the Atlanta area for so many years, I know that waiting through an extra cycle of the traffic light doesn't truly equal being caught in traffic. However, the point remains that I was stopped and could therefore take a photo or two. The first picture is of the Cleveland Donut Shop and Glenda's. Glenda's has THE BEST home-cooking around. You can see they're relatively plain little buildings but what goes on inside those buildings is NOT plain. Mainly though, I just wanted you to see how blue the sky was today. I didn't make any adjustments on the photo. It was THIS blue! You can see here the the leaves are just barely beginning to change. A few more cool nights and it's going to be really colorful up in here. This is the empty lot beside the old Babyland General. Fall decor beside the bank. Last year our friends at Loganberry Heritage Farm did the decorating... I don't know if they did this year or not. You know you live in a small town when there's a cemetery beside the local IGA. 3. I spared you the 28 million cat pictures from yesterday. I have to share this one though... my sweet Little Kitty taking over the lap where the laptop should be. Acting like he owns this place. 4. We had guests last weekend... my dad's friend Fred and his wife Daisy. Pop and Fred have been friends since I was a kid. Ironically, Fred and Daisy's daughter lives with my kids' dad. It is semi-awkward for me but eh... I mean, it is what it is. It makes it hard to hate on your ex when your ex is their daughter's beau but I don't really do a whole lot of hatin' on him anyways. He missed out on a lot of stuff with my kids and I could have used his help and his money but I got very little of either and they turned out to be pretty decent guys and I get all the credit. The end. 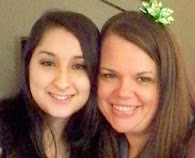 My kids' dad has been sober for a month or two and that's a big deal. I don't want my kids to have to bury their dad and I don't want Cody to have to worry about whether or not he's showing up to work. He's reportedly doing better about going to work and I'm sure his present girlfriend has something to do with it. She comes from good people. ANYWAYS... I said all of that, to say that when Fred and Daisy came to see us they brought this lovely plant and Little Kitty LOVES it! He had killed off most of my mom's other plants so this is a whole new challenge for him. P.S. I totally gave Austin heck about Fred and Daisy being his Meemaw and Pappaw. 5. I did laundry today and made instant mashed potatoes and field peas for dinner. I also cleaned the sliding glass door in the Whine Cellar because the bug guts on it were blocking my gorgeous view of the lake. I consider that a highly productive day. 6. My sister-in-law called tonight with a great idea about what to do for Grandma's 90th birthday which is next month. It's a really good idea and I'm pretty much the only one who can do it. It will take some creative energy but it will be good for me to have a project. I'll share it with y'all when I get it finished. 7. I read ahead to the end of the series on Breaking Bad and I still want to watch it but... last night I decided I would rather watch Orange Is The New Black and I enjoyed it more. That's what I'm about to do... break out the old Netflix. Hope you guys have a great weekend! Love and hugs!